profit of all the firms, it means that all the firms an; ‘making just normal profits besides covering average cost of production. We can then easily conclude that industry is in equilibrium as in this situation the firms would have no tendency either to enter or leave the industry. If the price is greater than average cost including normal profits, it means that existing finns arc making super-normal profits. This will induce new firms to move into the industry. This movement will continue until the super-normal profits arc competed away. On the other hand. if the price is less than the average cost including normal it follows that firms arc making sub-normal profits, i.e., having losses: therefore, some firms will be forced to quit the indus try until the existing terms are at least covering average cost including normal profits, we have drawn a curve ACP which represents average cost of production and docs not include normal profits. 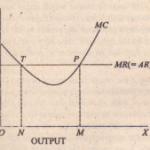 If in ACP we add normal profits, we get AC curve which is the summation of the average cost of production and normal profits calculated per unit. The normal profits per unit will fall progressively as output increases. This is because a fixed sum of total nonnal profits will be spread over a progressively large number of units of output. Consequently, the vertical distance between ACP and AC = (ACP + NP) curve will steadily fall but the two curves will never for instance. at the output level OM, the normal profit per unit is fG and at output ON, thc normal profit per unit is RS. It should be carefully noted that rectangles showing normal profits such as EFGH and QRST would be of equal areas as we are assuming that normal profits represent a fixed sum of money.